it's hard to believe, but i don't think i've ever posted a tutorial before. several people asked me to post a tutorial of the felt bowls i've been making of late. i should preface this by saying that i am total beginner at this and what i'm really posting here is my experience with this medium. if you're a real felter, you may want to go visit some other site now, as you'll probably be appalled at my technique. :-) however, it has worked for me and i've really been enjoying the magic that is needle felting. the first step is to get yourself a big cup of coffee or tea, as this process takes awhile. i'll admit, i drink a lot of nescafe's instant espresso. it has that lovely foam that i don't want to know how they achieve in a powdered product. instant coffee, a guilty pleasure. and now let's get on with the felting. these are the tools of the felting trade. i call that big one with the 5 needles in it "the big kahuna." sabin insists it's called "the kachunk." you can name yours whatever you want. there are different grades of fineness in felting needles. here in denmark, the ones we can get don't really have numbers assigned to them, tho' i've seen that elsewhere - we can buy fine, medium and regular, which seems rather similar to medium. the needles aren't like regular sewing needles, as they have very fine little barbs along the sides. oh, and you WILL poke yourself with them eventually. sometimes all the way through your finger, so be careful. it can be handy to have a wooden holder on the needle, as you are poking it in a LOT of times and the needle without it can begin to make your fingers sore. that said, i often use the medium single needle on its own. i have a fine needle for finishing work in the smaller holder. and in the big kahuna, five regular needles. you will break a needle at some point (usually when you've just stabbed it one side of your finger and out the other) and the holders are easy to change them out. that bit of foam the needles are stuck in is another essential item. this piece, i cut and used to make the bowls on the weekend. it comes as a square and is the perfect working surface for your felting. you should be able to find these where you find your felting supplies. and you will need to replace them regularly as they definitely wear out if you're doing a lot of felting. next, you need some wool roving in the color of your choice - wool is key, as synthetic materials or cotton won't felt. i buy roving in craft stores and fabric stores and, of course, online. this beautiful piece of hand-dyed wool, i bought on etsy. i blogged about it previously. if you're in the market, i can recommend this etsy shop and this one. or, if you're lucky enough to have your own sheep, ask him or her to donate a bit of wool. to make the bowls, i have tried both the crudely cut piece of felting pad above and this time, a styrofoam ball, as pictured below. you end up with a more flat bottom using the felt pad and a bit more round with the ball, tho' even with the ball, it's still possible to create a flat bottom. tear off a piece of roving in a size you can manage and begin covering the ball with it. i roll it and needle it into place with the big kahuna, then i continue rolling it and poking it repeatedly with the needles. it is sticking to the ball, but it's also sticking to itself and beginning to felt. the longer you poke with the needles, the more they do their felting magic. keep winding until the bowl reaches the height you'd like - i went about 2/3 of the way on this styrofoam ball. if you run out of roving before you reach the height you wish, just tear off another piece, overlap a little bit and keep going. you basically can't poke this too many times with the needle. once it becomes closer to the bowl you'd like to see, you can switch to a single needle and keep felting. i worked especially on the top, poking in along the edge, to form a nice, smooth, rounded edge on the top. if you can see that there are areas where the felt is thin, you should add more pieces and continue poking them. the poking is quite therapeutic and if you want, you can imagine people you're angry with, but mostly, it takes you to kind of a meditative state. you can work on making the bottom a flat surface as well - just keep poking and it will flatten out. this whole poking process took me about 30 minutes or so, so it's a task which requires patience. once you think it's felted together enough, you can remove it from the ball, carefully peeling it back. 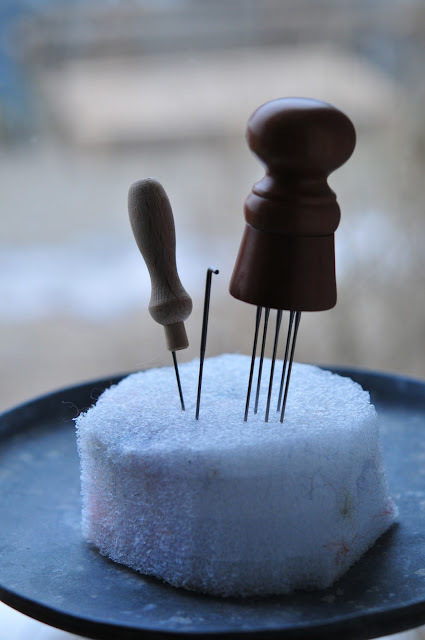 some styrofoam bits will come off in your fibers, but you can flick them out with the needle. i may have to find a solution for this, but as of yet, i haven't. once it's removed from the styrofoam ball, you'll see that there are thin spots. you should needle more felt onto the bowl, both on the inside and the outside, until it's the thickness you'd like it to be. you'll need a felting pad for this, as you have to have something to stick the needles into. you may also pop it back on the ball as needed. if your roving, like mine, is multi-colored, take care to choose the colors you'd like in the spots you'd like them. basically, you just keep poking. it's simply magical how those fine needles cause the fibers to grab hold of one another and hold their form. i'm still working on this little bowl, but it's getting close to finished. you can decorate it by stitching on it or by attaching little curly locks of fiber around the top. and voila, you have a little treasure bowl of your very own. and if you don't feel up to all that poking, you can find a couple of little treasure bowls here. as far as the time required, one bowl takes about two episodes of boston legal. good luck and take good care of your fingers! if you have questions, just leave a comment and i'll try to answer them. if you can crochet, you can also crochet your bowl using wool yarn and then felt it with warm soapy water (or even throw it in the washer) afterwards. but i find there's something really magical about transforming an actual ball of fluff into a usable little vessel, so i like the needle method. plus, i can't crochet to save my life. Thanks for the tutorial. Now I have to find episodes of Boston legal and than I can make a start. "A real felter" you slay me. These are adorable! Have you tried wet felting them after you take them off the ball? Something my kids like to do is wet felt around a stone then cut a slit to remove the stone, and they have a little pouch they can stuff tiny treasures in. Have you thought about putting this on Youtube? Will keep my fingers crossed! i have another friend that felts beautiful roses and she gave me a hint to go to the thrift store and buy old 100% wool sweaters. she then washes them in a machine and dries them to begin the felting process. she then cuts them into strips to form the flowers - different than the bowls but still a pretty product. i used felting to make christmas stockings year before last and i was happy with the results. but instead of stryo i used this thing that looks like a scrub brush. it was good for a flat surface. Oh your tutorial was a hoot! Particularly loved the first step (coffee is indeed required for many crafting projects! ), your statement that it takes patience (30 minutes is a long tie for you? ), and of course the comment about taking your aggressions out as you poke. Felting is one craft process I've never done..This tutorial was very helpful...makes it seem easy! Both of your bowls are darling. Have you seen the coiled fabric rope bowls? I can so see your bright pattered material made into those! Thank you for the tutorial - I will definitely give it a bash one day! So essentially a lot of poking is required? This was interesting as I had often wondered how felting occurred! In essence you wrap wool around a ball and poke it with needles. I can see how it might be theraputic. Can you make color spots by felting them in after you've made the bowl? I may have to try this just once. I have a couple of handmade felted hats (somewhere), but I've never seen the process. very cool, i have made felted purses using the knit first, shrink later method, and i had a lot of fun doing that but i always wanted to try needle felting. you made it look quite easy but i am sure it takes some practice. the bowls are so cute! Just a heads up on the styrofoam ball, try using the smooth styrofoam balls..no chips! And your bowls are very pretty. I was reading an Art Elements blog article on wet felted vessels, and wondered if they could be made by needle felting. I enjoyed your tutorial very much. I have plenty of wool, but I don't think the layering, wet felting with the balloon method is for me. I am going to give your method a try sometime soon.